If you have any questions or want to enquire about dates, use our form to contact Selva Borquez or see their website for more information. Rumour has it that a temple dedicated to Venus lies in the grounds of this rust-red Veronese house – something to consider over abundant homemade breakfasts on the lawn. Selva Borquez, a true polyglot, welcomes you with fresh-baked cakes and a lovely smile. You arrive down a majestic cypress-lined drive – such a surprise! – and there is the farmhouse (beyond is a villa); join hares and squirrels for peaceful bimbles in generous grounds or lounge in the pool during the summer months. The atmospheric breakfast room is cosy beneath its low chunky beams, while a Persian rug perches on the mezzanine beside a sofa with computer, maps, DVDs and toys. Delightful colour-coordinated bedrooms have superb garden views: catch garden glimpses from the tubs and showers of big bathrooms. The blue room has a generous bed and heirlooms on the walls; the red, decorative iron bedsteads and a well-loved bureau; the yellow, a romantic canopied bed and amazing sunsets. Feast at the friendly local trattoria, marvel at nearby Santa Maria’s 300 AD pantheon, lose yourself amid swaying trees and half-remembered lines from Romeo and Juliet. Guest kitchenette. Restaurant 5-minute walk. Singles €80-€100. Extra bed/sofabed €10-€20 per person per night. Casa Rossa Selva is the most welcoming host and the beautifully converted barn and farmhouse extremely comfortable. She could not be more helpful and friendly. Over the 3 days we stayed she was able to give most knowledgeable guidance on visits to Verona and to Lake Garda; she booked the most excellent restaurants and trattorias for us and made bicycles available. The adjoining villa is a wonderful C 16th Palladian mansion on a site occupied since Roman times. It is run by the family for weddings and parties. A perfect setting for sophisticated celebration! But no disturbance to Casa Rossa. We spent 10 relaxing days at Casa Rossa where we explored the region around Verona taking advantage of Selva's local knowledge and returned every day to her friendly hospitality and the welcoming pool. 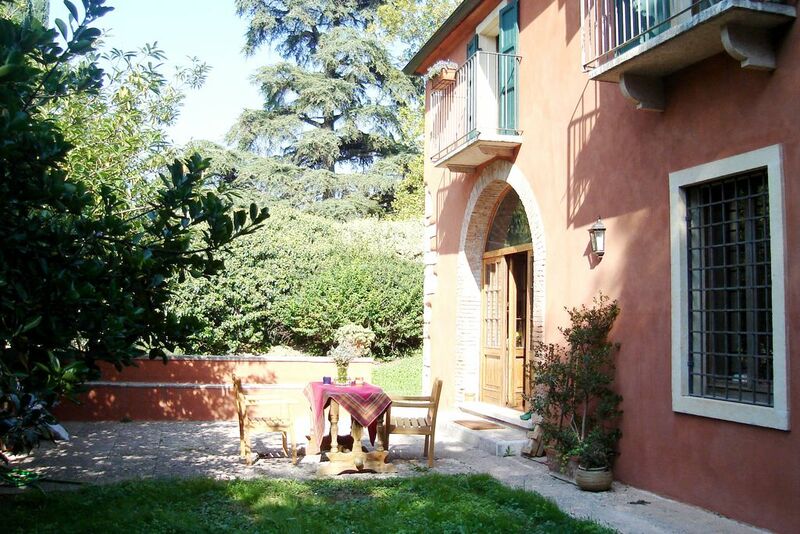 Casa Rossa is secluded and peaceful with a wonderful garden you can explore at leisure. Selva serves a delicious breakfast and makes fresh coffee at a time to suit your requirements. There is a useful small kitchen area if you want to rustle up a quick meal. WiFi access is limited and you will benefit if you ask for a room with mosquito nets in the hotter months. Overall a lovely, quiet retreat. Casa Rossa is truly spectacular; as we entered the front gates we were met with the magnificent view of a beautiful old villa at the end of a drive of Cyprus trees - it was like stepping into another world. Selva was a wonderful and friendly host who really cared about creating a wonderful experience for all of her guests. Breakfast was delicious every morning. Stayed for 3 nights in June, a great time had by all. Selva looked after us so well and especially our 4 year old. Grounds are spectacular too. The whole place was just so relaxing. Verona, Mantua and Vicenza are all within a 20-minute drive, while Venice, Padua and Lake Garda are reachable within an hour. The Lessinia mountains offer breathtaking views and trekking for all abilities; only 20 to 30 minutes by car. You will be astounded to discover the well preserved ruins of a Temple dedicated to the God of fertility going back to the IV century in the village next door, Santa Maria in Stelle.. only metres away from Casa Rossa!